This weekend, a local university displays the work of some of its art students, an improv group gets in the Christmas spirit, a local art gallery highlights up and coming talent, and one museum spends the day discussing one type of natural disaster. 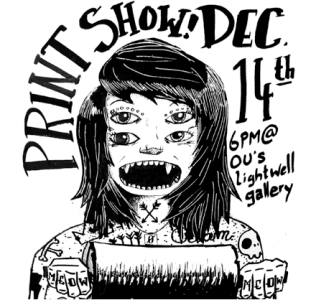 The University of Oklahoma School of Art & Art History ends the fall semester with a print making exhibition opening in the Lightwell Gallery in Norman. “Stop Staring at My Prints!” showcases work from this semester by advanced printmaking students in the art program and opens Friday, December 14th with a reception from 6:00 to 9:00 p.m. The opening also includes a fashion show with garments created by art students, several sculptures, and an interactive print project. The work is on display through January 22nd of next year. Topher Owen from the Second City comedy theatre out of Chicago directs Gravy Comedy during “A Very Made Up Christmas” at the Actors Warehouse Studio in Oklahoma City. These entirely improvised shows begin this Friday, December 14th at 9:00 p.m. and continue on Fridays and Saturday through December 22nd. Topher Owen has been acting professionally for over 25 years with much of that time spent teaching improvisation. All shows have the potential to be R-Rated; parental guidance is suggested. There are scheduled family-friendly shows on Saturdays at 7:30 p.m.
Mainsite: Contemporary Art Gallery in Norman features six up and coming artists for its newest exhibit “The Unexplored: Emerging Artist Show.” The opening reception is this Friday from 6:00 to 10:00 p.m. and is part of the Norman Arts Council’s Second Friday Circuit of Art. “The Unexplored” displays work by Zach Burns, Krystle Brewer, Amy Coldren, Cindy Coleman, Tim Towalczyk and Christie Owen. Their art transcends a wide range of media including photography, sculpture, graphic design, collages, non-traditional ceramics and more. The exhibition closes January 11th. Science Museum Oklahoma and News 9 team up for Tornado Alley Day on Saturday, December 15th. Meteorologists Nick Bender, Matt Mahler and Chief Storm Tracker Val Castor from the News 9 weather team interact with guests in the Dome lobby between screenings of the IMAX movie “Tornado Alley.” Guests also have the chance to tour the storm-chasing vehicle used by Val Castor and learn about tornado safety measures from 1:00 to 5:30 p.m. The movie runs throughout the day from 10:00 a.m. to 5:30 p.m.
AAA offers their Tipsy Tow service once again during the entire holiday period. Beginning at 6:00 p.m. on December 14th, AAA will pick up any one who calls in Tulsa, Oklahoma City, Lawton, Shawnee, Enid, Bartlesville, Muskogee and Tahlequah and feels uncomfortable driving after drinking. The tow truck takes two people and one car to their house within 15 miles of the pickup point. This service is offered through 2:00 a.m. on January 2nd.